Being A marketing agency we often have to communicate a technical brief to our designers, helping our clients understand the technical language often used can simplify the process for both clients and designers. There are many different terms used when describing colour, and understanding the meaning of them will help you communicate with your designer. When you are creating a brief or your designer is presenting a design having a greater knowledge of the terminology used will help you get the design you really want. 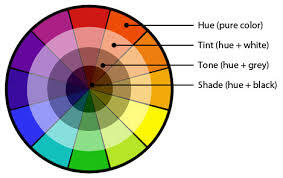 When we talk about “hue”, we are discussing the object’s colour. Red, orange, yellow and blue are all hues. The choice of hue used in your website can convey certain messages and give a certain feel to the website itself. The use of the hue red is popular in website design. The value of a colour refers to the lightness. Colours with a higher value are much lighter than those of a low value. For example, a bright yellow would have a higher value than a navy blue. When talking about the chroma of a colour, you are talking about the purity. A hue with high chroma will have no black, grey or white added to it. When this is added, the chroma lessens. Think of a high chroma colour as that which is a “pure, bright” colour. Using a gradual difference in chroma can create a gradient effect. Saturation is not necessarily how light or dark a colour is, but more how pale or strong it is. The use of a low saturation background will make any high saturation features on your webpage really stand out. A tone is created by adding grey to a hue. This then tones the colour down and creates a more subtle colour which can be more appealing to the eye. Tones can add a more vintage feeling to a website. Adding black to a hue creates a shade. Using different shades together on a webpage can work well as long as there is sufficient contrast between them to avoid a page that is too dark. A tint is the opposite of a shade as a tint is when white is added to a hue to make it lighter. Very pale tints are sometimes known as pastels, but a tint is created when a pure hue has white added to it. Pastels are popular with making websites feel very feminine – such as websites about babies or pregnancy.